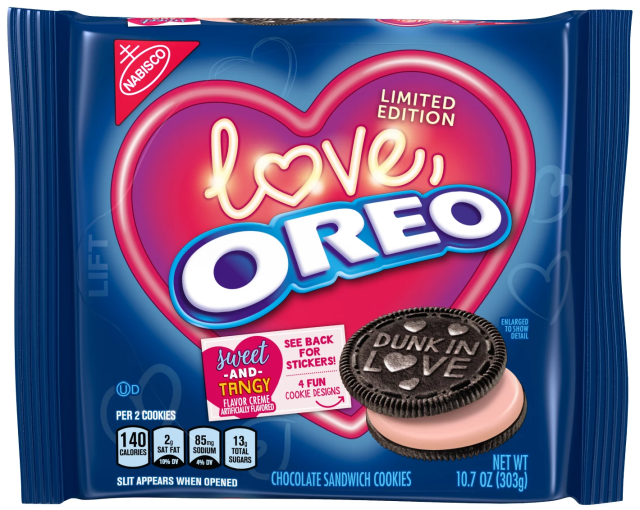 Oreos strikes a Valentine's Day theme with the arrival of new, limited-edition Love Oreo cookies (stylized as "Love, OREO"). The Valentine's-themed dessert features chocolate Oreo wafers in four different festive designs sandwiching a pink layer of "sweet and tangy flavor" creme. The cookies come in a 10.7-oz package for $2.99 or so. If you're having trouble finding them, you can order them online from Target.